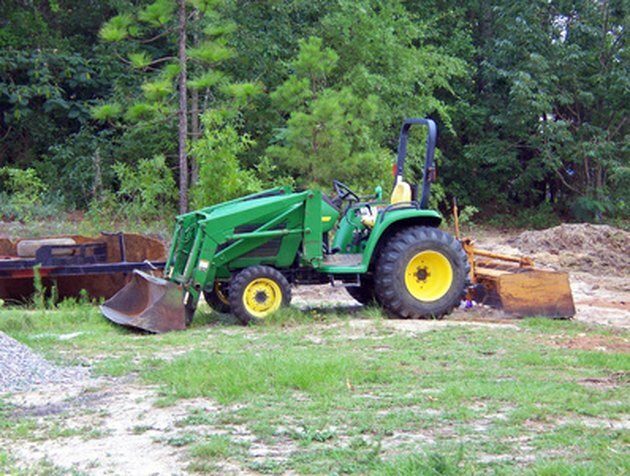 When you attach a powerful hydraulic front end loader to a tractor, one that is typically capable of lifting over one third the dry weight of the tractor itself, you have to counterbalance the potential load at the back of the tractor. You can ballast your tractor by adding weights to an attachment hooked to the tractor--usually referred to as a "ballast box." You can fill the rear tires three quarters full with liquid. Or, you can follow the recommendation of manufacturer John Deere and do both. Liquid-filled tires balance heavy bucket loads. Filling your tractor tires with liquid--commonly called "loading" your tires--moves the leverage point of the ballast to its lowest possible point. It also ballasts your tractor without occupying the three-point hitch, leaving it available for implements you may need at the same time as your front end loader. As expected, loaded tires are extremely heavy, which makes tire changes and repairs more difficult. Loaded tires direct the ballast pressure directly to the tire footprints. While this serves as an advantage normally, if the tractor is used on delicate turf, loaded tires will create deeper ruts than a tractor with its ballast more uniformly distributed through the three-point hitch. Calcium chloride remains the standard liquid used to load tires, despite its corrosive nature. It is inexpensive, adds 40 percent more weight than water alone, and prevents freezing. However, unless a tube is used and drips and leaks are methodically cleaned, the tire rims will eventually rust out. Tractor owners who live in regions where freezing temperatures aren't an issue can load their tires with plain water and avoid calcium chloride's problems. Windshield washer fluid and antifreeze are also common fluids for loading tires, but they are more expensive and can be toxic to plants and animals if they leak. A relatively new product on the market called RimGuard uses a beet juice mixture, which is heavier than water, protects from freezing, is noncorrosive and nontoxic. A tractor with a front end loader but without the right amount of ballast at the rear is a serious accident waiting to happen. Loading your tires is one of the most economical ballasting methods available. Read, follow and understand all warnings and guidelines for ballasting your tractor before operating it. What Happens When Batteries Leak?